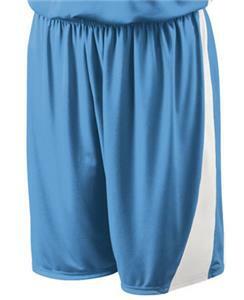 Holloway Reversible Select Basketball Shorts. Dry-Excel Fresh Micro-Interlock has a smooth polyester surface with high mechanical stretch for extended range of motion. Wicking and odor resistance keep athletes cooler and drier. Bottom hems not sewn together for easy decoration access. - Inseams: Adult 9", Youth 8"
WAIST 23" 25" 27" 29" 31" 33" 35"
HIP 40.5" 44.5" 48.5" 52.5" 56.5" 60.5" 64.5"
WAIST 24-26" 28-30" 32-34" 36-38" 40-42" 44-46" 48-50"